All transactions are safe and secure with a reliable history in online purchasing behind each of our associates. Buy the Pulp Fiction Bert and Ernie t-shirt to own Pulp Fiction clothing and merchandise. This funny Bert and Ernie Pulp Fiction t-shirt features the Sesame Street characters posing as Vincent and Jules. Below these two best friends is the Sesame Street sign, only here it displays the title Pulp Muppet. Wear the tee as you practice reciting Ezekiel 25:17, which you can pretend is today's Sesame Street lesson. Buy it with a Big Kahuna Burger t-shirt or hat. 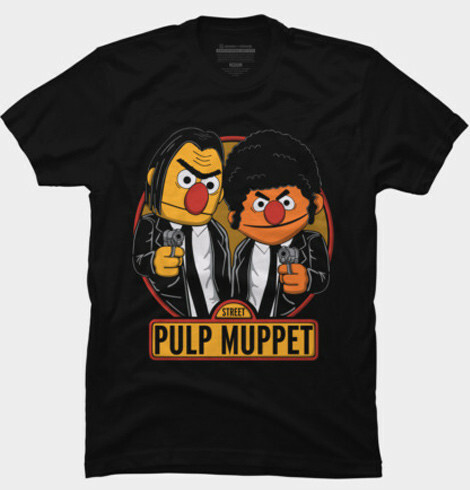 In addition to the Pulp Fiction Bert and Ernie tee above, browse the Pulp Fiction Clothing Gallery for more apparel like men's and women's clothes, kids shirts or hoodies.